Bleed Eagles Green: Philadelphia Eagles Blog: Gotta Love the Pride! Economy crashing. Politicians being stupid (still can't believe that the Flyers are having Palin drop the puck for the season opener!). Just having a bad day. 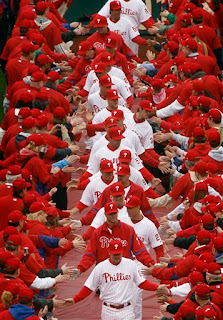 Forget about it...the Phillies are playing tonight!! Took a quick trip over the local Sports Authority at lunch and the store was packed with everyone picking up their Phillies gear for the start of the NLCS. Jerseys, hats, flags, t-shirt jerseys...had to wait in line for a good 15 minutes. I love it! Sports...the perfect escape from reality. No city has better fans or more passion for their teams then Philadelphia!